After the excellent reception of the last six editions, the print edition of Dodho Magazine has become a phenomenon in the current photographic panorama, postulating itself at this moment as the professional magazine of reference in the industry. Our printed edition is designed as a promotion platform in direct contact with galleries, agencies, and professionals of the photographic industry from around the world and created as a talent distribution channel that has an undeniable prestige among professionals in the sector. The rapid distribution and promotion of each edition develop a tool capable of positively promoting your career in record time, placing your work and images in the right place, at the right time and in the hands of the most influential people in the photographic industry. Getting the recognition that your photographs deserve is often complicated, it’s not an easy path, you know it’s the opposite. Along the way, you will find many bumps and people trying to discourage you. If you have been attempting to promote your photography, you will know better than anyone that opening a door is a slow and complicated task. This is precisely our reason for being. Dodho Magazine has done this work for you and the best experts, galleries and agencies from all over the world hope to discover the newly published photographers in each edition. No doubt a powerful and elegant tool for presenting your work to the eyes of experts worldwide. Success is a matter of personal choice, stop waiting for them to knock on your door and go for them, accept the challenge, give your photographs an opportunity and all the effort you have dedicated to them. If you are convinced that your photographs deserve greater recognition, just start today to trace the path. 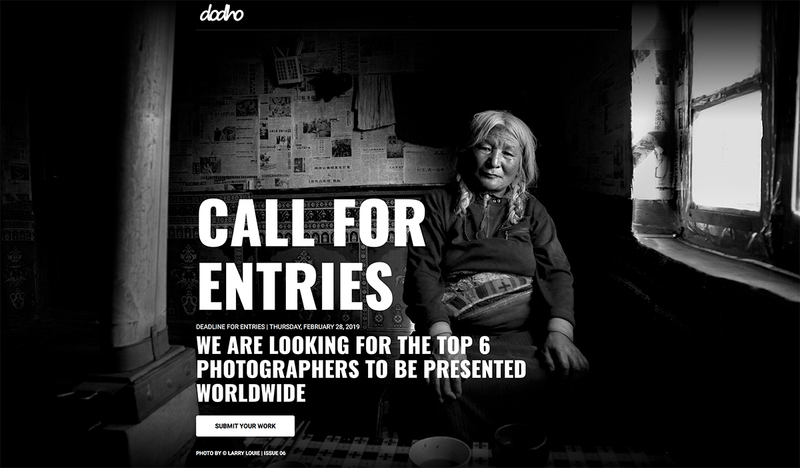 An international judging panel composed of directors of Klompching Gallery (USA), Kuala Lumpur Photography Awards (Malaysia), Head On Photo Festival (Australia), Alice Zilberberg (Canada) and the management team of Dodho Magazine will select the works and photographers to be presented in this new edition. We accept all genres, always and exclusively in the field of photography. All participants to Call For Entries 07, by virtue of their presentation, believing the images and projects presented are their own work and there has been no infringement of copyright. Dodho is not responsible for any infringement of rights may arise during the selection process and subsequent display of any image. The entrant is responsible for obtaining, prior to submission of the photograph, any and all releases and consents necessary to permit the exhibition and use of the photograph. The projects will be judged by a professional and relevant jury in the photography field, with no flare and none of the author data. The jury’s decision will not be appealable and will be definitive.